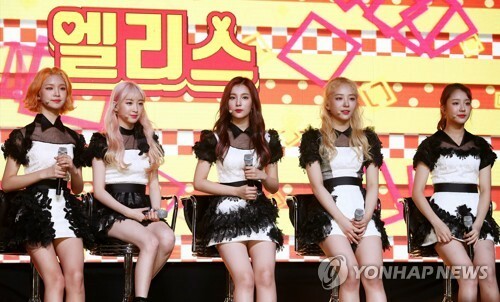 SEOUL, Sept. 13 (Yonhap) — Rookie K-pop act Elris on Wednesday released its second EP record “Color Crush,” expressing its ambition to win the year-end’s rookie of the year award. “I really hope to win the rookie of the year award through our latest promotional activity,” member Sohee said during a media showcase held at Yes24 MUV Hall in western Seoul. Elris isn’t pulling any punches when it comes to the highly sought honor offered by major TV networks and music streaming services at the end of the year. The five-member act, which debuted in June, so far enjoys the biggest profile among this year’s new girl groups, thanks to Sohee. “The song is about how a person’s heart is about explode (before confessing their love to someone),” Sohee explained of “Pow Pow” while thanking MonoTree. While it’s just been three months since their return, the ladies apparently thought their comeback mandated a drastic image change. Bella had her long hair cut to above her shoulders while bandmates Hyeseong and Yukyung had their hair bleached for a neon flair. “We’ve done away with our pure and innocent image and tried something more drastic. We’ve worked hard to share with the fans our refreshing and bubbly charm,” the team said. If you suspect that someone is using your Gmail account without your authorization, we recommend that you change your password.